President Obama, if you look closely at his positions, is a moderate Republican of the early 1990s. And the Republican Party he’s facing has abandoned many of its best ideas in its effort to oppose him. If you put aside the emergency measures required by the financial crisis, three major policy ideas have dominated American politics in recent years: a plan that uses an individual mandate and tax subsidies to achieve near-universal health care; a cap-and-trade plan that tries to raise the prices of environmental pollutants to better account for their costs; and bringing tax rates up from their Bush-era lows as part of a bid to reduce the deficit. In each case, the position that Obama and the Democrats have staked out is the very position that moderate Republicans have staked out before. I’m a big fan of Mr. Klein’s work, but I don’t find his thesis persuasive in this case. Instead, I’d suggest that the evidence points toward a considerably less exciting conclusion. Rather than being an early 1990s moderate Republican, Mr. Obama is a prototypical, early 2010s Democrat. And although a 2010s Democrat shares more in common with a 1990s Republican than with the Republicans of today, they are still far from alike. It’s fairly easy to demonstrate that Mr. Obama’s policy preferences resemble those of a typical Democrat in today’s Congress. A system called DW-Nominate, developed by a group of six political scientists, rates each member of Congress on a scale from negative 1 (very liberal on economic issues) to positive 1 (very conservative) based on their roll-call votes. The system also creates a score for each president based on cases in which the outcome he desired from a vote in Congress was clearly articulated. 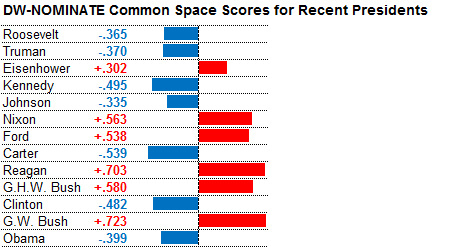 According to the system, the score for the average Democrat in the 111th Congress was -0.382 (negative 0.382), although there was a fairly significant range, from very liberal Democrats like Dennis J. Kucinich (-0.612) and Barbara Lee (-0.743) to moderates like Heath Shuler (-0.100) and Ben Nelson (-0.030). Mr. Obama’s score of -0.399 was very close to the average, splitting the difference between his party’s liberal and moderate wings. He typically leaves some room to his left. On initiatives ranging from health care to financial regulation, members of the Congressional Progressive Caucus, as well as many liberal bloggers, thinkers and activists, have complained that his positions concede too much to the Republicans. But Mr. Obama’s positions also generally draw some complaints from moderate, Blue Dog Democrats, and do not always win their votes. Mr. Obama’s positions are also broadly in line with the median Democratic voter. According to polling conducted by Public Policy Polling, a Democratic-leaning firm, 70 percent of Democrats think Mr. Obama’s positions are “about right”, and those who disagreed were about as likely to say he was too conservative (12 percent) as too liberal (14 percent). But the more challenging question — and the one more central to Mr. Klein’s thesis — is how the parties’ positions have shifted over time. The authors of DW-Nominate argue that their system can be used to address this question. At their Web site, and in books like “Ideology and Congress”, they argue that the preferences of individual legislators are relatively stable across time, so shifts in the ideological preferences of Congress can be measured by how newly elected legislators vote as compared to the old ones. According to the system, both parties have been on a trajectory toward more “extreme” positions since roughly 1970, the natural result of which is more polarization. However, the parties do not quite share equal responsibility for this: Republicans have moved about twice as much to the right as Democrats have to the left. Also, while the Democrats’ leftward shift was essentially a one-off event, the result of many moderate, Southern Democrats losing their seats in the early 1990s, the Republicans’ rightward transition has been continuous and steady. The rightward shift of Republicans is even more apparent in the scores that DW-Nominate assigns to their presidents. George W. Bush was more conservative than his father (although similar to Ronald Reagan); Reagan and both Bushes were more conservative than Richard M. Nixon and Gerald R. Ford; and Nixon and Ford were more conservative than Dwight D. Eisenhower, according to those scores. By contrast, there has been no consistent pattern among Democratic presidents. Mr. Obama, according to the system, rates as being slightly more conservative than Jimmy Carter, Bill Clinton and John F. Kennedy, but slightly more liberal than Lyndon B. Johnson, Franklin D. Roosevelt and Harry S. Truman — although all of the scores among Democratic presidents are close and generally within the system’s margin of sampling error. Another finding is that the Democratic presidents, including Mr. Obama, have often adopted a different strategy than Republicans. Whereas Democratic presidents usually have scores fairly close (but just slightly to the left of) the median Democratic member of Congress, Republican presidents — with the very clear exception of Eisenhower — articulate legislative positions that are equivalent to those held by one of the most conservative members of their party. We need to be careful in interpreting these results. The positions that presidents advocate on Congressional roll calls can be subject to a number of tactical considerations, and may not be entirely representative of their ideology. Nevertheless, there is some support for the notion that Democratic presidents take positions that — while still quite liberal — are at least somewhat more amenable to compromise. By contrast, Republican presidents push as hard as they can to the right and let the chips fall where they may. A lot of liberals advocate that Mr. Obama should take a page out of the Republican playbook, and instead take more emphatically liberal positions like those held by the Congressional Progressive Caucus. It is not self-evident, however, that this would lead to more liberal policy outcomes. Instead, the presidents who have had the most domestic policy success — like Roosevelt, Eisenhower and Johnson — have generally held DW-Nominate scores closer to the median than to the extremes. To take one salient example, Mr. Obama’s health care bill was somewhat less liberal than the one pushed for by Mr. Clinton (and Mr. Obama’s bill became less liberal still over the course of negotiations in Congress). However, Mr. Obama eventually succeeded in passing a bill, whereas Mr. Clinton never came particularly close despite having similarly sized majorities. On the other hand, Republicans — despite having taken continually more conservative positions — have not seemed to pay a price in elections to the Congress. They have controlled both the House and the Senate in most years since Mr. Clinton became president in 1993. As a result, the position of Congress as a whole has generally drifted to the right on economic issues over the course of the past 30 years. Even in good Democratic years, like 2008, the average member of Congress is slightly less liberal than he or she was throughout almost all years in the 1960s and 1970s. 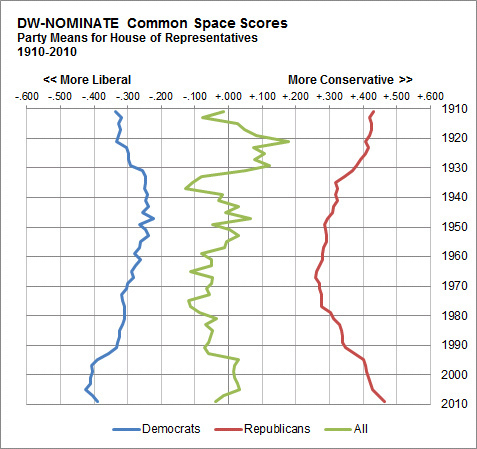 By contrast, although DW-Nominate scores are not yet available for the current, Republican-dominated House, it could easily wind up being the most conservative since the Great Depression. I’ve given a lot of credence to the DW-Nominate scores in this article, assuming that they do a reasonable job of capturing shifts in the ideological positions of Congress over time. In truth, after having read “Ideology and Congress,” I’m not entirely persuaded that they can capture all of these dynamics. The system is essentially blind to the content of legislation, so if there are changes in the types of bills that Congress votes upon, there could be long-run ideological changes that are not well accounted for by the system. Measuring ideological change is one of the trickiest questions that political scientists face, and a complete treatment would require a thesis- or book-length approach. At the same time, the DW-Nominate system has a number of virtues. It’s completely objective. It captures a broad array of votes rather than a select few. And the scores are derived from votes that actually occurred in Congress — rather than positions that some Democrats or Republicans may have advocated at one time or another for strategic reasons, but wouldn’t have been willing to vote for with the chips on the line. Some of Mr. Klein’s examples, also, are problematic. For instance, although the idea of an individual mandate for health insurance — later borrowed by Mr. Obama — may have been a Republican invention, the 1992 Republican platform was vague at best on whether Americans should be required to carry health insurance (the overall language is very similar to what Republicans put forward in 2008). And although the first President Bush may have passed a cap-and-trade system to combat sulfur emissions, neither he nor Mr. Clinton advocated anything of the sort for carbon emissions, which would be an order of magnitude more expensive to regulate. It is almost certainly an exaggeration, therefore, to conclude that Mr. Obama’s positions are similar to those of a Republican of the 1990s. His DW-Nominate scores are considerably to the left of even the most liberal Republicans of the 1990s — and slightly to the left of most 1990s Democrats. At the same time, Mr. Klein is right that the Republican platform has shifted significantly toward the right. Some of the positions they have adopted recently — like the actions against public unions they have taken in Wisconsin, Ohio and other states, and the budget adopted by the Republican House — would have been radical by the standards of a Republican like Bob Dole. Whether their strategy is successful will be determined by American voters in the next couple of elections.